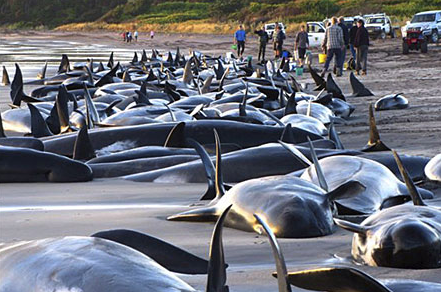 Earthquake Prediction: 650 Whales Strand in New Zealand Beach !!! 650 Whales Strand in New Zealand Beach !!! WELLINGTON, New Zealand (AP) — A new pod of 240 whales swam aground at a remote New Zealand beach on Saturday just hours after weary volunteers managed to refloat a different group of whales following an earlier mass stranding. In total, more than 650 pilot whales have beached themselves along a 5 kilometer (3 mile) stretch of coastline over two days on Farewell Spit at the tip of the South Island. About 335 of the whales are dead, 220 remain stranded, and 100 are back at sea. Department of Conservation Golden Bay Operations Manager Andrew Lamason said they are sure they're dealing with a new pod because they had tagged all the refloated whales from the first group and none of the new group had tags.